After migrating to web extension of the uBlock I can't sync my devices anymore. It seems to be able to sync (download) only when I have uploaded something but this would erase all the changes that I have uploaded from the other device. Try to pull some new changes from Sync. Only upload button is shown. Sync is enabled, not sure if it's enabled by default. I don't think these are relevant in this bug. I don't understand your issue. In your steps-to-reproduce, there is no step which says "Click 'Export to cloud storage'", hence of course there won't be anything to import from cloud storage. If your issue is that your cloud storage was filled with legacy uBO data, then it's expected you can't import it with webext version, the Sync data is stored in a different way with webext version. If you are unhappy with this, you will have to close the issue here and open one at bugzilla. The problem is that I exported it to cloud from another device but am unable to import on other devices. This worked with the legacy version of uBlock. You exported with what version of uBO? What Firefox version was it? I did try the Sync feature, and it worked fine here. Not sure if it's Firefox/Sync to blame or if uBO should send smaller objects? I internally work with chunks of max size 6,144 character-long string segments, which to me seems safe enough taking into account that this is put through JSON.stringify. What sort of string derived from a ruleset would cause a 6,144 character-long string to expand to 8,763 bytes once JSON.stringify'ied? I don't have any other custom rules. Ok, so FF encrypts and then encodes the result as base64. Unfortunately, from what I see the per-item data size limit applies after the encrypting/encoding, so this makes it more difficult to find a safe max chunk size -- both the encryption and encoding add their own data size overhead, and add to this FF's own information (like last_time_modified) is added to the original data. It could be argued with Firefox people that the limit should apply before the encrypting/encoding. I just lowered the max chunk size for now to at least avoid failure, I verified it works with your ruleset. If you are willing to use the dev build, fix is in 1.14.9b1 in AMO's dev channel. Log in to Sync in both FF 55 and FF Nightly. It seems I had to push the button to upload the rules again and after that it now works. Superb job! Hmm, I am seeing the same issue right now. I am using Firefox Developer v57.03b and Firefox 55.0.3. I installed the latest dev build 1.14.11rc3 of uBlock Origin. 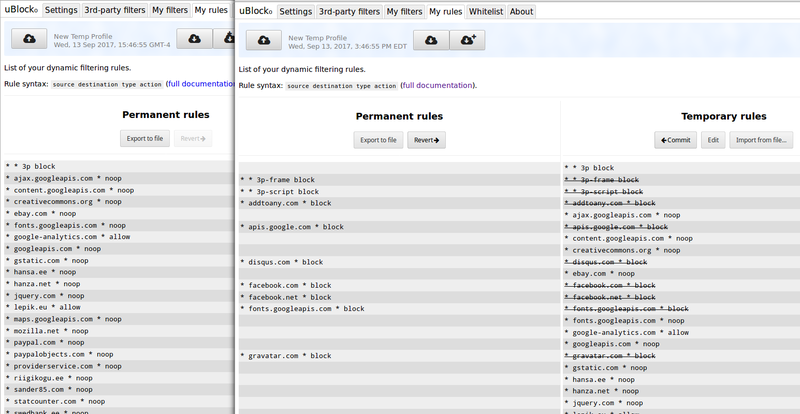 Sync works for "My Filters" and "Whitelist" tabs (I can see the backup with the name of the other instance), however "3rd-party Filters" and "My Rules" do not show the uploaded settings from the other instance. I checked the sync-log, and similar to @sander85 , I see errors such as below. Maybe we need to lower maxChunkSize even more? Restoring from another instance via cloud sync works to Firefox Developer v57.03b in all tabs. However, it only works restoring to "My Filters" and "Whitelist" tabs in Firefox 55.0.3. Let me know what other debugging info I can provide to assist with this issue. uBO 1.14.10 does not have the fix here, tests should be done with 1.14.11rc?. I lowered the ratio to 0.5, and I will push this to 1.14.11rc4 today. I re-named the device in uBO on Developer Edition (DE) to something unique, then uploaded all four tabs of settings to the cloud. I forced a sync in the menu of DE. Once that finished, I forced a sync in regular Firefox. As mentioned earlier, I only see the new uploads available to download in uBO in regular Firefox on the "My Filters" and "Whitelist" tabs. The "3rd-party Filters" and "My Rules" tabs are blank in the blue cloud area at the top indicating there was no synced data to download. I believe the lines below are the related errors. Let me know how I can help debug further. That makes little sense, I lowered a lot the ratio to the point where the little difference you reported in #3006 (comment) should be amply covered. Maybe Firefox is still trying to push the too big data tried from a previous run? What if you push first empty set of data in Firefox 55 in the 3rd-party Filters" and "My Rules", then force a sync. Afterward, try again to push from Dev edition, and see if now you can finally import into FF 55. Good idea. That solved it. Thanks. So if this worked, then I should add code to immediately delete whatever uBO tried to push in the event of failure, so as to not cause the case of perma failure you suffered. Hmm, sounds reasonable with my limited knowledge of the uBO codebase. This won't fix past cases of push-failure however, apparently Firefox will try to push again whatever had fail in the past without uBO being involved. So below are the reference steps to work around the issue. Clear all the data (save it somewhere temporarily, like in a text file). Push (the now empty pane) to the cloud. Paste the save data back in the pane. I'm an active user of uMatrix and I assume this issue (or a similar one) affects it (version 1.0.1rc2) too but there is no issue tracker where to report it. The problem is that only the upload button is available but nothing happens when pressed. Tested with FF56 and FF57 beta and with uMatrix versions 1.0.1rc1 and rc2. I also tried the work around steps above with no success. @juhakoho fixed in rc3, which I just published on AMO. Thanks @gorhill ! rc3 is working just perfectly!